Eternal Orthodox Church calendar for the 11.09 year 2017. 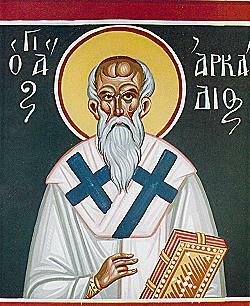 Herod Antipas, son of the Herod who slew the young children in Bethlehem at the time of the birth of the Lord Jesus, was ruler of Galilee when John the Baptist was preaching. This Herod was married to the daughter of Aretas, an Arabian prince. But Herod, an evil branch of evil stock, put away his lawful wife and took Herodias, his brother Philip's wife, to live with him while Philip was still alive. John the Baptist stood up against this lawlessness and strongly denounced Herod, at which Herod threw him into prison. At the time of some feast at his court in Sebastia in Galilee, Salome, the daughter of Herodias and Philip, danced for the guests. Herod, in his cups and carried away by her dancing, promised her whatever she asked, even to the half of his kingdom. Instructed by her mother, she asked for the head of John the Baptist. Herod commanded that John be beheaded in the prison and his head brought on a platter. John's disciples took the body of their teacher by night and buried it, but Herod tore out John's tongue with a needle and then buried his head in an unclean place. What later happened to John's head is recorded and can be read under February 24th. God's punishment was quickly visited upon this group of evildoers. Prince Aretas, to avenge his daughter's honour, attacked Herod with his army and brought him to his knees. The defeated Herod was condemned by the Roman Caesar, Caligula, to exile first in Gaul and then in Spain. As exiles, Herod and Herodias lived in need and debasement until the earth opened and swallowed them up. Salome, Herodias's daughter, came to a bad end in the river Sikaris (Sula). 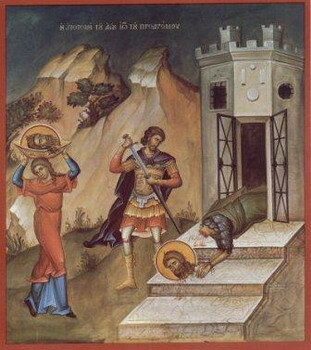 The death of John took place before the Passover, but its commemoration on August 29th was instituted because it was on this day that a church, that had been built over his grave in Sebastia by the Emperor Constantine and the Empress Helena, was consecrated. In this church were also placed the relics of John's disciples, Eliseus and Audius. A wealthy and devout woman, she lived on the island of Aegina, but, when the Arabs over-Tan the island, she moved to Salonica. There, she gave her only daughter to a monastery, where she received the monastic name Theopista. Her husband Theodorinus died very soon, and then Theodora became a nun. She was a great ascetic. She often heard angelic singing, and would say to her sisters: "Don't you hear how wonderfully the angels are singing in heavenly light?" She entered into rest in 879, and a healing myrrh flowed from her body, which gave healing to many. She suffered for Christ in Srem. A young man from Radoviste in the diocese of Strumica, he learned a trade in Salonica. The Turks tried to force him to become one of them, but he refused firmly. For this he was tortured and finally hanged, on August 29th, 1794.